After the Shippensburg race weekend got cancelled due to inclement weather, the second day of the Hell of the North was cancelled as well. But regardless, MIT cyclists were eager to attack the ITT and criterium of April 14th, and had dominant performances in both events. Liam demonstrating proper sprint technique in his criterium win! Going into this weekend, I was pretty apprehensive about what it might bring. The forecast continued to look grimmer as the weekend drew closer and by Friday, the weather gods were calling for temperatures in the mid-thirties and some mixed precipitation. Sweet. Awesome. Great for cornering hard in a crit with a new bike. The ITT in the morning went well with MIT sweeping many of the top spots in all categories and pulling in a huge number of Omnium points. Go Tech! And as we transitioned over to Dartmouth’s Frat Row to get ready for the crit, things dried up and it actually began to look like we could have some good conditions for racing. We had a blast watching the early races with Coach Nicole providing commentary on strategy and suggestions on critical points in the course. She turned to me, Berk, and Quinn (aka the Killa Beeeees aka MIT Men’s B riders) and asked, “So what’s your strategy? Do you guys know what you’re going to do?” I replied, “Yeah we have a detailed agenda. Many planning. Much strategy.” We of course hadn’t discussed anything. The race kicked with a fast few laps and then things settled in until the bell rang for the first prime lap. Berk attacked like a bat out of hell and 4 riders chased. As soon I saw them hit the finish line, I sprinted out of the group to draw up next to the 5 riders yelling “Let’s go, let’s go we have a gap, time to work!” in classic Liam fashion. Everyone gave me a quick glance and sat up, ready to head back to the pack. Except, of course, Berk who is always down for getting #rekt. Now, Coach Nicole might say it’s stupid to attack 10 minutes into a 50-minute race in a two-man break with a teammate since the pack would almost certainly work hard to shut it down. But when in bike racing, YOLO as bike racers do (or maybe YGDS as some might say). So anyway, lap after lap we steadily grew the gap 2 seconds here, 5 seconds there. Until finally with 2 laps to go we turned the corner and there was the pack. We had lapped the field and, we were absolutely thrilled to find, the Quinn Bee was sitting at the front – totally wiped after a long day of blocking and shutting down attacks. As it turned out, we had executed team strategy perfectly, with Berk and I working together very well at the front and Quinn doing everything he could to keep the rest of the race from catching us. 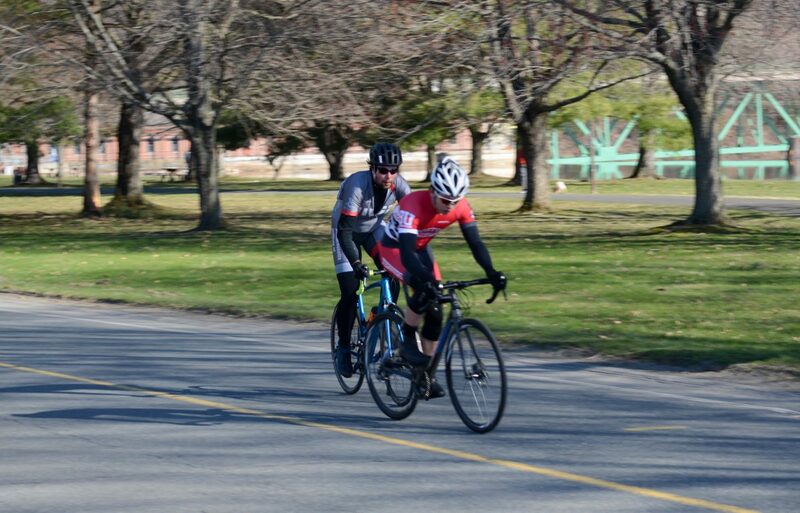 I’d never had the opportunity to cruise casually across a crit finish line shoulder to shoulder with a great teammate and I don’t expect it’ll happen again soon- it’s definitely something I’d recommend giving a try if you ever have a chance. Sometimes you just need to decide to go for it in a race and once in a blue moon it works out exactly the way you’d hoped. Repping MIT in the break! This weekend marked the first time this season that we had 3 women in the A/B race, since Amy just upgraded to the B’s! 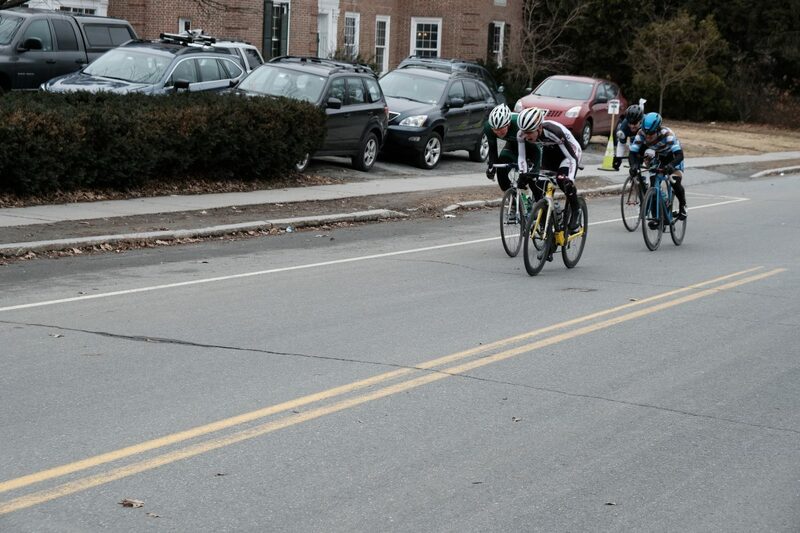 With no Sunday races, we stepped up to the crit ready to empty the tank with whatever we had left. In our race, and early attack split the field and resulted in a break of 5 riders, including myself and Emma. We rode a majority of the race with just the 5 of us. Despite getting caught near the end, an RPI rider attacked again and we re-formed the break with a substantial gap. Getting into the break (twice!) and riding there for most of the race had taken quite a bit out of my legs, and so I used what I had left to lead out Emma into and out of the final corner, and get her in position for the sprint. Her bike skipped a gear near the very end of the sprint, and she took a close second to the RPI rider. I rode in for 3rd in the Women’s A category and 5th overall. Coach Nicole was there, and provided great strategy and insights (and much-needed hot water) all day. The team had an incredible showing today, and I’m really excited to see what we can do in the final weekend of the conference season! This year, the team sent only two racers to the NYC Metro Showdown hosted by NYU, Columbia, Rutgers, and Army on 3/31-4/1. Sadly, the much anticipated West Point races had been cancelled, and the ECCC decided to bring back this race which had been held two years ago, in order to fill the open weekend. Our riders Wade and Tori held down the fort and raked in some valuable omnium points. Wade and I made the drive to Valley Cottage, NY for the circuit race, which featured numerous laps of a 3.7-mile course. The course had a slight climb, but it was quite short and so we were both prepared for a sprint finish. Given that there had been a significant number of crashes here two years ago, we carefully scouted out the course Friday evening to identify where we wanted to be positioned at various points on the course. Wade was executing our game plan and riding a good race in the Men’s C field until an unfortunate mechanical which ended his race after a few laps. The Women’s A race played out more or less how I had expected. There were several attacks on the hilly section, but the pack largely stayed together. After 9 laps, the race indeed came down to a sprint. 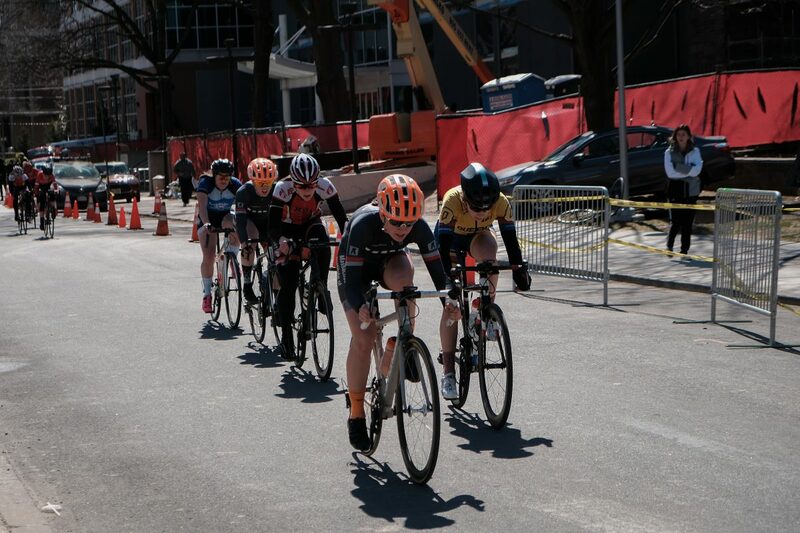 I was well positioned and was able to grab the wheel of the strongest sprinter in the field, which ended up being a perfect lead out, and I sprinted for 3rd place. The next day featured a crit which was hosted by Rutgers on their campus. The course had 3 corners and one long, sweeping turn. Wade was ready to go for the crit, especially since his race had been cut short the day before. A lot of attacks and surging made for a challenging race. The rider off the front had been reeled back in before the finish and the race came down to a field sprint. Wade finished in the top 15, and also snagged 2nd in two primes to bring in some solid points for the team. In my race, there was an early solo breakaway that was ultimately able to stay away for the win in a very impressive performance. In an effort to earn some points towards keeping the green jersey, I went for primes, taking 2nd in 3 of them, and 3rd in the other. The rest of the race came down to a group sprint for second. I started my sprint a little too late, but got across the line 2nd of that group to take another 3rd. Despite some nervousness on our part about the courses, the weekend went quite smoothly with minimal crashes across all fields. It was definitely out of the ordinary having only two people at a race weekend, but it was a success nonetheless! The second road race weekend featured some dominant performances from our women in the A field. 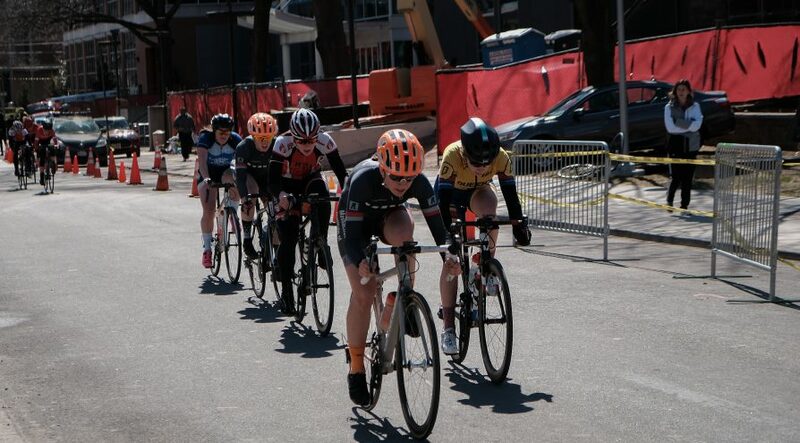 Emma not only won the road race, she also placed 2nd in the Women’s A criterium, with Tori picking off primes to get a huge lead in the points competition. In the men’s D criterium, we saw a great display of teamwork where our riders launched attacks throughout the race. The kept this up until Dmitro attacked for a 2nd time, and stayed away until just before the finish line on the last lap. Miles, Andre, and Dmitro ultimately nailed 3 of 5 top spots in the race. Berk, Quinn, and Dustin, i.e. the “Killa B’s” also employed some effective team tactics, which involved a heroic effort from Dustin to initiate the winning 3-man breakaway, and stay away from the field to ultimately take 2nd. In a true ECCC fashion, it was yet another cold weekend, which featured some snow flurries on Sunday, but everyone raced hard nonetheless. It was great to see some of the strategy we’d learned from Nicole get implemented (and work!) in races. 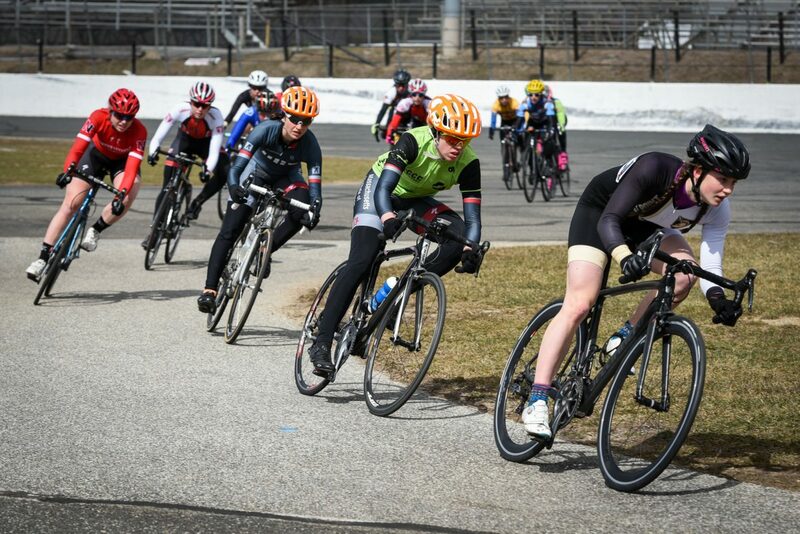 The UConn race weekend was my first time racing, so my main goal was to stay upright and get a sense of how strong everyone else was. It was pretty chilly on Saturday morning and I made full use of Quinn’s luxurious heated seats on the drive to the TTT. There were two Men’s D teams: myself, Dmitro and Tobi on one and Felix, Biswaroop and André on the other. I was expecting the TTT to be an unpleasant suffer-fest, but I had an absolute blast! There’s not much that can beat riding fast outside with your teammates after being holed up inside on the trainer all winter. Our Men’s D teams ended up coming in 1st and 2nd place, even beating the times of the two Men’s C teams, and the Women’s A and Men’s B teams also got 1st, making for a great start to the weekend. Next was the road race, which was a 21 mile, two lap course for the Men’s D field. Our race had 60 riders, so I decided to try and stay with the front ten riders and see what happened. I’m glad I was near the front, as there were two crashes in the first lap that I was totally oblivious to. The pace during the first lap was tame, and I could sense a lot of the others growing impatient, but I was happy to save my energy and just cruise along. The second lap was where things got interesting. About 4 miles from the finish, there was a crash going up a hill (go figure…) which Dmitro and Biswaroop unfortunately got caught up in but Felix and I narrowly avoided. Someone yelled, “There’s been a crash, this our chance!” and suddenly there was complete mayhem with everyone trying to break away. Felix and I managed to pair up and we worked together to try and slowly pick off the approximately 10 riders in front of us. The end of the course featured two short hills before a downhill finish. Felix was a champion and put in a huge effort to pull me up the first hill allowing me to hurtle down the other side and catch a few more riders. By that point, there were only three people ahead of me, but I was suffering and to my dismay, there was still one more hill. I convinced myself that I was being a total wimp since this hill was nothing compared to Mount Palomar (which we had ridden up twice during winter training camp), and I went all out up the final hill and managed to pass two of the remaining three riders. I was gaining on the final rider, who turned out to be from my hometown of Toronto, but didn’t have quite enough time to catch him. Kudos to him for staying away from everybody! I came 2nd (all thanks to Felix! ), Felix 5th, Tobi 12th, André 13th and Dmitro even managed to finish mid-pack despite crashing. 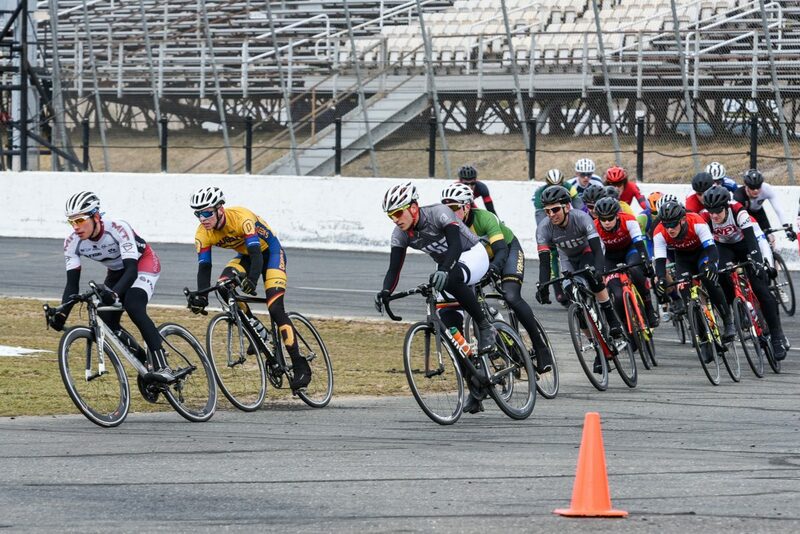 The criterium on Sunday was held at the Stafford Springs Motor Speedway meaning that there were no sharp corners like in a more conventional crit course. While most people were disappointed about the lack of technical corners on the course, I was secretly happy to have an easy course for my first crit. Dmitro attacked in the second lap which caused everyone at the front to panic. The pack caught him within a lap or two but he had definitely tired a bunch of people out, allowing André to win both prime laps. Then, with about fifteen minutes to go, Dmitro attacked again off the front. This time, with a superhuman effort, he managed to stay away and the rest of the MIT riders got to practice some blocking, to the frustration of the other teams. Remarkably, the pack only caught him in the final turn of the last lap. Coming into this last corner, I was sitting in a good position, about three wheels back from the leader, but of course, had completely forgotten all of the useful tips that Coach Nicole had taught us during the sprinting clinic. I started my sprint too late, after someone else had already sprinted past me, but I managed to hang on for a second place finish, with André coming 3rd and Dmitro coming 5th. I had a fantastic first race weekend thanks to the support and encouragement of all of my teammates! I learned a lot and hope to put it to good use in the coming races. 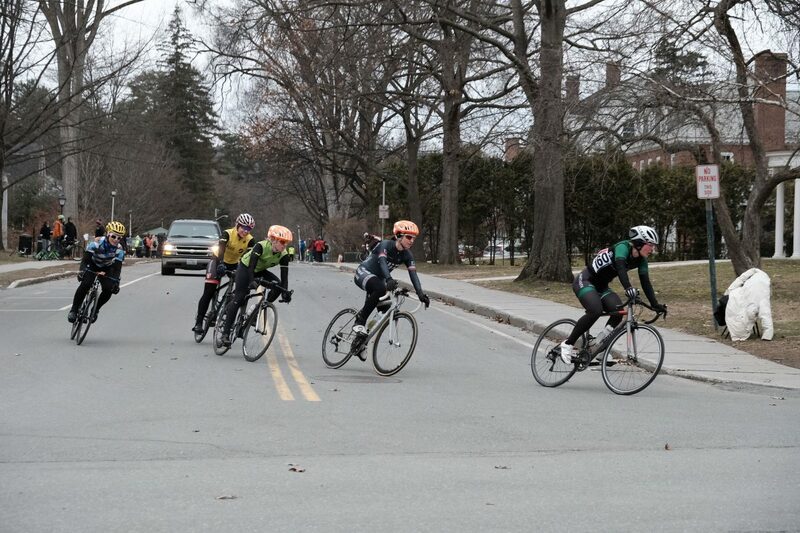 After a seemingly never-ending winter, MIT Cycling was well prepared for the frigid opening race in Philadelphia. 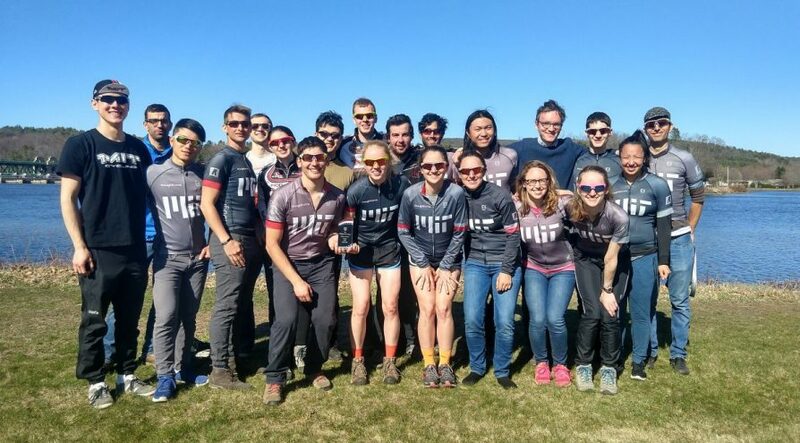 We fielded 9 members with 3 of them being newly minted MIT racers. 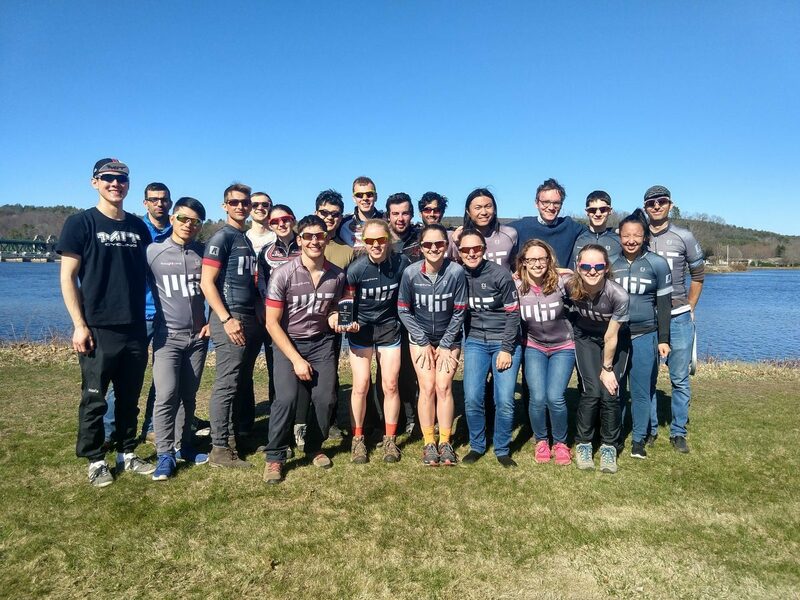 Although the conditions were adversarial, MIT Cycling had plenty to be happy about, with some strong performances all around, and even a smashing 1-2 victory by Jack and Biswaroop in their first collegiate race weekend. 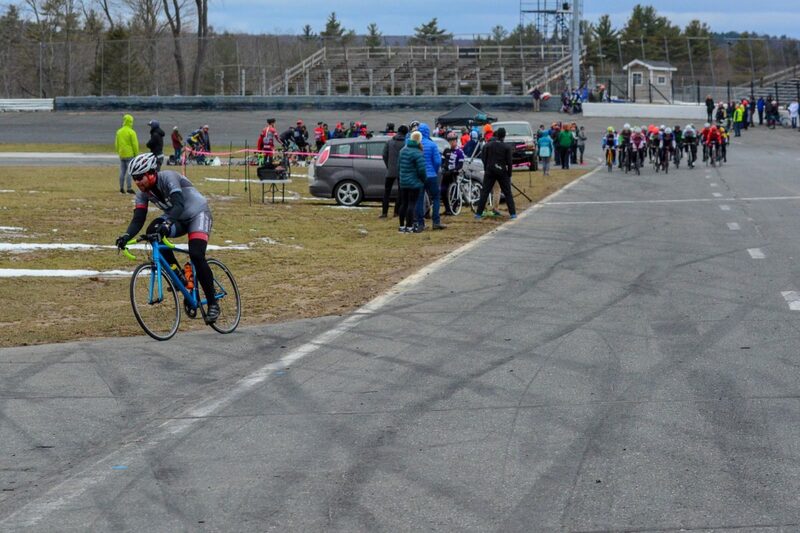 The first race weekend of the Extremely Cold Cycling Conference (the better-known name for the Eastern Collegiate Cycling Conference) began as expected – my Garmin reported that it was 25 degrees as we warmed up for the first event, the Team Time Trial. This was my first TTT with the women’s A team, so I was a bit nervous, but my nerves diminished somewhat once we discovered that we were racing unopposed. Despite being unopposed, we did not take it easy, and I quickly confirmed just how much stronger Emma and Tori are than I am! After taking a couple of turns pulling in the usual rotation, I was tiring at an unsustainable rate (and the cold air in my lungs didn’t make things any easier). So, I transitioned to “sitting in”, yelling “in” every time that Tori or Emma pulled off the front so that they would pull in front of me, and I could sit on the back and avoid the considerable extra effort of pulling. The TTT course runs along the Schuylkill river and is very flat, with only a small downhill at the beginning and uphill at the end, so there were few distractions, and I began to appreciate just how hard a TTT can be. Nonetheless, we did finally make it to that small uphill at the end, sprinted for the finish line, and, took first place! And also last place. Our next race was the Circuit Race, which also ran along the Schuylkill river, but included an additional small hill. Turnout in my field (women’s C) was… underwhelming… to say the least. We began the race with 7 riders, but by the time we descended the small hill after 15 minutes, only 3 of us remained in the front “pack”. So, we spent the next hour TTT-ing around the course as I tried to figure out how I could beat the other two women. Because the course doubled back on itself, we could also see the other fields that were racing concurrently, so I watched Emma and Tori ride by several times. Unfortunately, my scheming was largely unfruitful. I decided to try to escape the other women on the final hill, but apparently they had the same plan! We all accelerated up the hill and around the final loop together, turned into the headwind on the finishing stretch and sprinted. Alas my legs had had just about enough at this point, and I watched sadly as the other two accelerated away from me across the finish line to take 1st and 2nd. I guess I’ll need to practice my sprinting more! 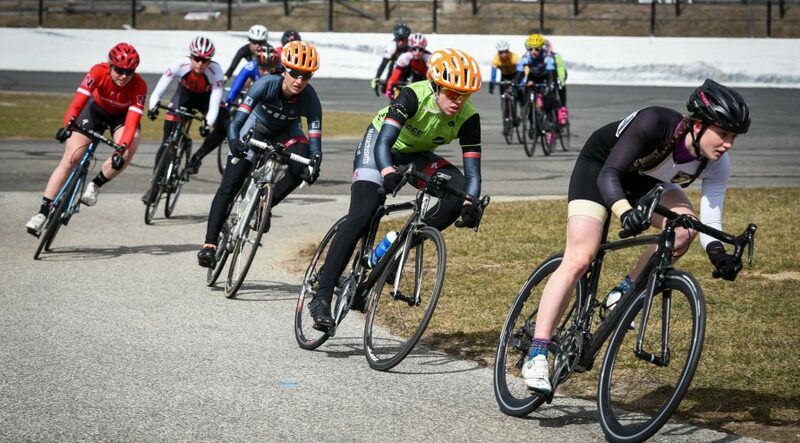 Among the other MIT racers, Tori was notable as having neither started nor finished her circuit race officially. The races had been running behind schedule but suddenly began running on time again without warning, so she raced to the start line and chased up to the group as they rounded the first corner; apparently in all of the rush the officials didn’t successfully record her as starting the race. Unfortunately she got a flat tire and so was unable to finish the race either. In his first road race, Cosmo crashed in the first corner, significantly damaging his wheel, but thankfully not himself. 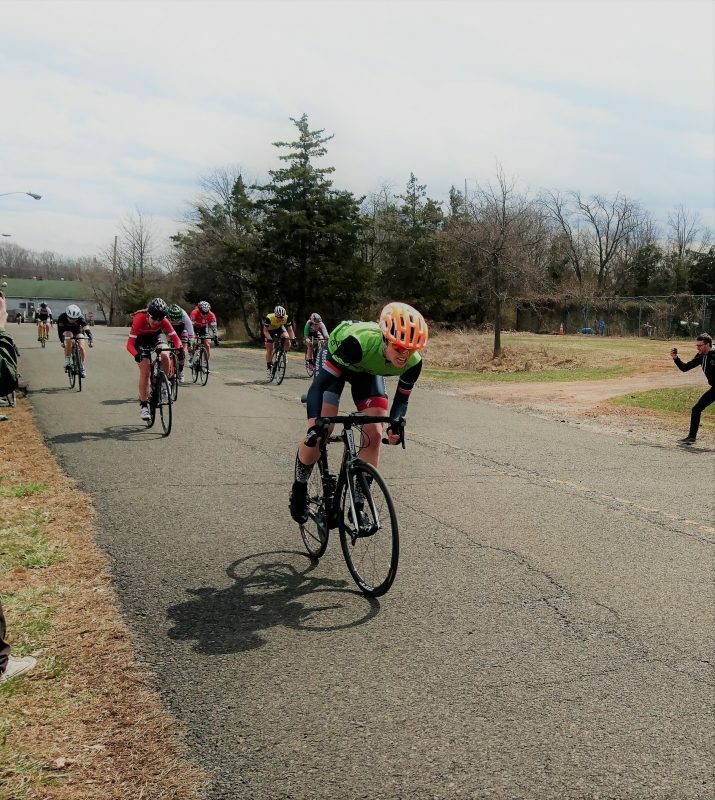 Other riders fared better – Emma took 4th in women’s A, and Berk took 7th in men’s B. 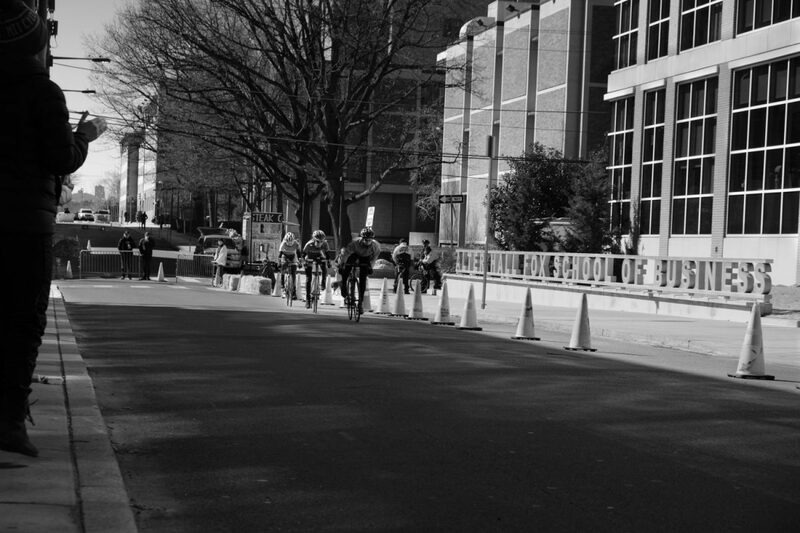 The criterium on Sunday was a traditional 4-corner crit around city blocks at Temple University. However, the course was made more interesting by the fact that it narrowed to a single lane for a block due to construction. This meant that riders were unable to ride three or four abreast as they would normally in a crit, and instead all of the races strung out into long single file or two-by-two lines. Of course, this was extremely important in women’s C, which had dwindled to only six riders. 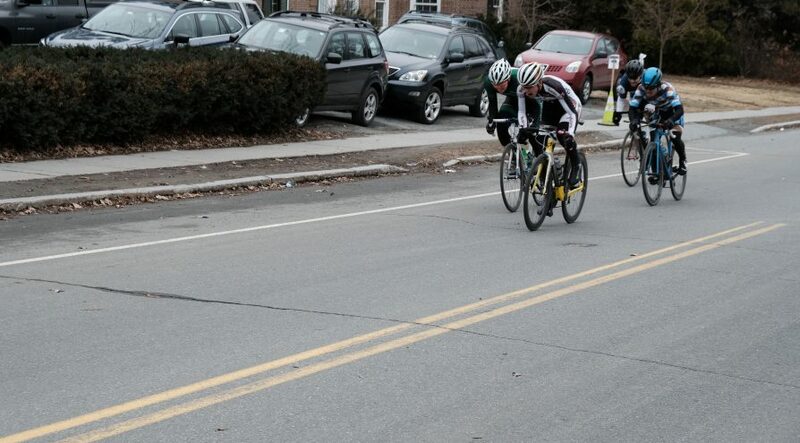 After riding most of the race with the same two women as on Saturday, I lost the final sprint to take second. In the men’s E race, Jack and Biswaroop raced off the front from very early on, to take 1st and 2nd by a considerable margin. 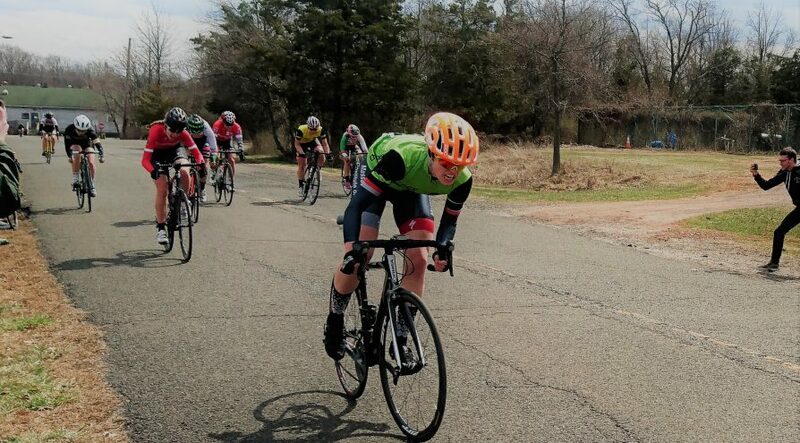 In women’s A, Tori and Emma took 3rd and 4th, and Tori racked up tons of sprint points to claim the green jersey. Overall the day turned out to be much warmer and more pleasant than Saturday, and we were even briefly serenaded by a marching band whose path, unluckily for them yet amusingly for us, ran perpendicular to the crit course! As we packed into the cars and began our 6-hour drive back to Cambridge, I was already looking forward to UConn the following weekend, and hoping that more than five other C women were too! As a team, we are looking forward to build on our successes as the top team in the ECCC in the omnium.